Radda in Chianti and its numerous hamlets all lie in the heart of the Chianti Classico territory. some new activities have begun to appear in the fields of handicrafts and small industries, furniture and ceramics. 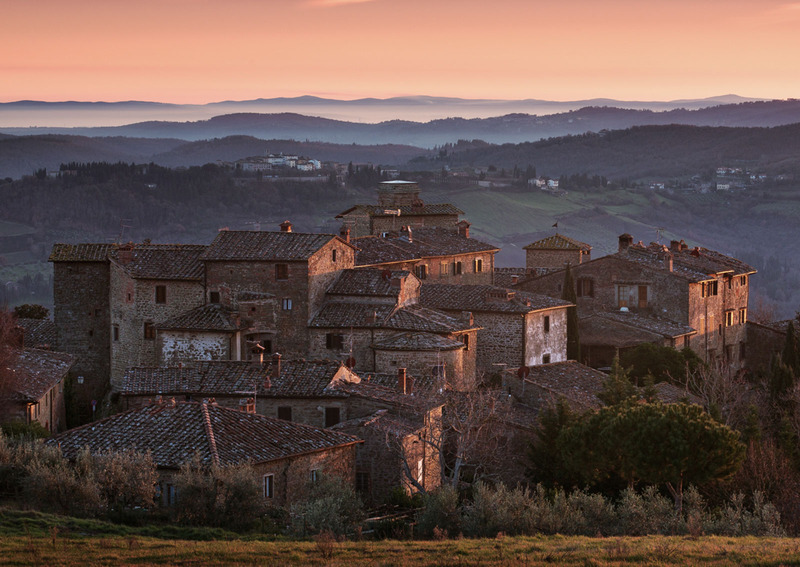 Situated in the heart of the Chianti hills, the territory of Radda has kept its charm intact through the ages. In the 1950s, its land and cottages were abandoned, but in the 1970s the old terraced vineyards and olive orchards that were by then uncultivated and neglected were replaced by a more intensive and widespread cultivation thanks to the resurgence of the farming activities, both large and small, which were already present in the territory, as well as some new ones that have started up in recent years. The careful renovation of the old farmhouses, the restoration of the old terracing, the adaptation to the hillside territory of the new vineyards as well as knowledgeable preservation of the environment, have all contributed to giving the area, which is completely within the limits of the Chianti Classico zone, a harmonious and well-blended look. Alongside the production of wine and olive oil, whose excellent qualities are well-affirmed also abroad, some new activities have sprung up recently in the fields of handicrafts and small industry, especially in the construction sector, as well as that of furniture and of ceramics. With the boom of tourism, another activity has been developing, that has seen numerous accommodation facilities appear, especially in the farm holiday sector, and has led to the renovation of some buildings in the historical town centres, now used as luxurious hotels. The origins of Radda date back to 2000 BC, when a group of people settled at the top of Poggio alla Croce hill; the remains of an ancient village and some artefacts have recently been uncovered and they are now housed in the museum of Castellina in Chianti. Few traces of successive settlements of Etruscan people remain, visible still today in the foundations of some farmhouses, in the few findings of terracotta remains and in the discovery of a hut-shaped tomb in the area called Malpensata; some traces, which are the subject of recent studies, are at the site of “Poggio La Guardia”, an excellent lookout on the ridge that overlooks the Arno river valley, and at a place called Castellare near the village of Volpaia. On the other hand, unmistakable remains of one of the most important Etruscan-Roman settlements occupy the top of the “Poggio di Cetamura” hill in the municipality of Gaiole in Chianti. In the 5th century AD, when the Roman Empire collapsed due to the Barbarian invasions, the Chianti area was made up of small villages of 5 or 6 houses, whose names are still heard today: Radda, Monterinaldi, Volpaia, Castalvecchi, Capaccia. During the 9th and 10th centuries AD, with the establishment of the feudal system, the fortification of the Chianti area began; at that time, the area was in the hands of the Guidi Counts and of the Marquis of Tuscany; Radda began to attract people and to grow. In 1100, Radda (whose name “Ratta” appears in a historical document of 1003) was the most populated and the most important centre among the surrounding ones, due also to its central position and the vastness of the land it was able to control. The 11th century witnessed the gradual development of the system of the “mansi”, that is small pieces of land given by the lords of the period to the tenant-farmers who occupied the “houses of the workers”; the latter were arranged in small groups, often around a church. Parish churches were built which acquired quite an importance in the administration of all of the smaller churches and in which, besides carrying out religious services, the sick were cared for, the poor were looked after and travellers were given hospitality; moreover, the registers containing the personal data of all the people were kept there. 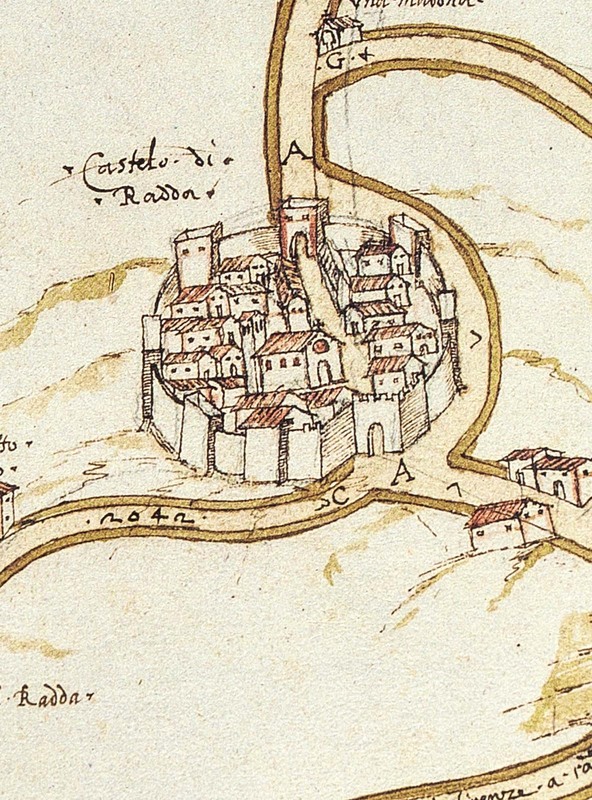 At the time of the birth of the communes and until 1500, Radda found itself at the centre of the conflicts between Siena and Florence that were fighting over the division of the border lands. When the Republic of Florence, beginning in the middle of the 13th century, organized the peoples of its countryside into “leagues”, the territory of Chianti formed one of the major ones. The castle of Radda was the main city of a “terziere” (the third part) and then of an entire league, and the castle then became the seat of the “Podestà” (the main authority). The 1600s have been defined as the century of Chianti because it was then that the area became well-known thanks to its wine, which was already being exported to England from the mid-1500s. Farms and the villas of the landowners appeared during those years; the landowners came to spend the summertime in these country homes, and we need only recall the Strozzi family and the Pazzi family from Florence. Sharecropping, which was to dominate agriculture up until the 1900s, became more and more widespread, and was officially abolished only in 1967. Today, within the circle of walls of the ancient castle of Radda, the medieval town is still intact; here you can admire the old “Palazzo del Podestà” (which housed the various authorities of the commune), built in the 1400s and boasting a beautiful fresco painted in the 1500s by the Florentine school of artists. Outside the building and around its portico you can also find the very interesting coats-of-arms of some of the Podestà who were in power throughout the years; these date from the 1400s to the 1700s.One of them, made of sandstone, is especially worth mentioning and you can see it just inside the portico; it is the coat-of-arms of Francesco Ferrucci, the hero of Gavinana, who was “Podestà” in 1527, a very turbulent period during Charles V’s invasion of Italy. Interesting documents regarding that period can be found in the rich historical archives that a group of archivists and historians are restoring and cataloguing. Opposite the Town Hall is the Church of Saint Nicholas, patron saint of the town, inside of which is a wooden Crucifix that is much venerated by the population. Also quite interesting are the square of the castle, the medieval communication trench, the Grand Duke’s ice house and the walk around the walls. Nearby is the Franciscan Convent of Santa Maria al Prato, an important building with a beautiful inside cloister; the history of this Convent begins in the Medieval Period. It was renovated in the 1700s and inside the church next door to it there is a valuable work of art: a “Madonna and Child” by Neri di Bicci, dated 1474; recently, the Chianti Storico turned it into a multimedia centre where the territory and its wine can be rediscovered. Next is the medieval village of Volpaia, where there is quite an unusual religious building, the church of Sant’Eufrosino a Volpaia (Saint Eufrosino was an evangelizer who lived in the Chianti region), called “The Commenda”, dated 1443. The castles of Albola and Monterinaldi, the hamlet of Badia a Montemuro, called the “Badiaccia”, with the little church dedicated to Saint Peter, are all very interesting. Major evidence of the ancient religious organization comes from the Parish Church of Santa Maria Novella which, even though the inside was redone in the 18th century, still maintains the original structure, as the decorative Romanesque capitals show; also interesting is the baptismal font with its majolica tiles from the Della Robbia school.